Wednesday the 4th of December, 5 students were suspended by the Vice-Chancellor Michael Farthing for their involvement in the occupation of the Bramber House Conference Centre which ended yesterday. The occupation left peacefully to support the nation-wide strike in defence of Fair Pay in Higher Education. The five students have been suspended because of their role in the occupation and “persistent disruption of the University operation”. Clearly, they singled out five students for their involvement in a movement of students and staff fighting for a more democratic university. Draconian suspensions are not democratic. The five students may be accompanied by more students as events unfold. They have been banned from campus and suspended from their studies effectively immediately, whilst they wait for the university’s disciplinary procedures to decide whether they are guilty or not of these allegations. 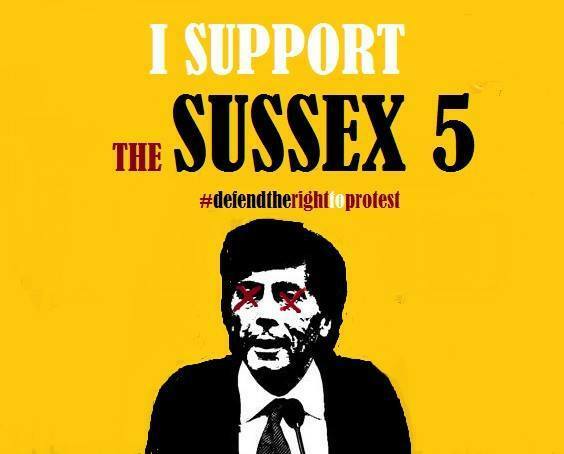 Management are scared by staff and students protesting for a more democratic university: Come to Library Square on Thursday at 1pm to show that Sussex WILL NOT BE INTIMIDATED. Demonstrate for the freedom to protest! Tomorrow at 1pm in Library Square! Workers and students at the University of Sussex who are opposed to the plan to privatize 235 jobs. The occupation, and the associated violence, vandalism and intimidation, was in blatant contravention of the University’s regulations on student discipline. The University has been astonishingly lax in upholding its own regulations, but I am overjoyed that it has now started. The only thing I’m worried about is that only 5 have been expelled. When will the rest of the mob face the punishment it deserves? dominic…you are clearly a disruptive minority and your views are so out of step with the vast majority on campus, that you would be well advised to stop making yourself look like a conceited idiot by refraining from further ill informed, disingenuous comments that seem to imply that anyone who disagrees with the privatisation of public services deserves all they get from an elitist bunch of overpayed lacky’s who were put in their jobs to screw us all…yourself included, though you seem too blind to see it. that’s just my opinion, but if you really must put your tuppence worth into this debate, count yourself lucky that your sychophantic opinion is one that management deem acceptable. who are you, and why is highlighting the marketisation of higher education something that you disagree with so strongly? 10 years living and working on campus and as part of the community…numerous daily interactions and conversations with co-workers, students, parents, managers at lower and middle levels…the number of yellow squares in windows, the messages of support from around the world, from politicians, the media, and former students…of course maybe we should be ignoring our own experience in favour of what we hear from internal comms and the badger, m’lord! What percentage of the campus residents are international students? Is the ‘vast majority’ of them in favour of the occupation? I tend not to discriminate along lines of nationality when talking (and more importantly, perhaps) listening to others as a general rule. should i start doing that in future maybe, so i have a defence ready for your next facetious point? i do on the other had discriminate heavily against anyone arrogant enough to call themselves ‘Lord’. …perhaps instead you can give me a citation for how many oppose it since, rather than stating it, you have simply implied it by posing the question. University of Sussex disciplinary hearing collapses, as the top QC’s stand alongside students, for not holding fair trials.